USS KING was the fifth ship in the FARRAGUT - class of guided missile ships. 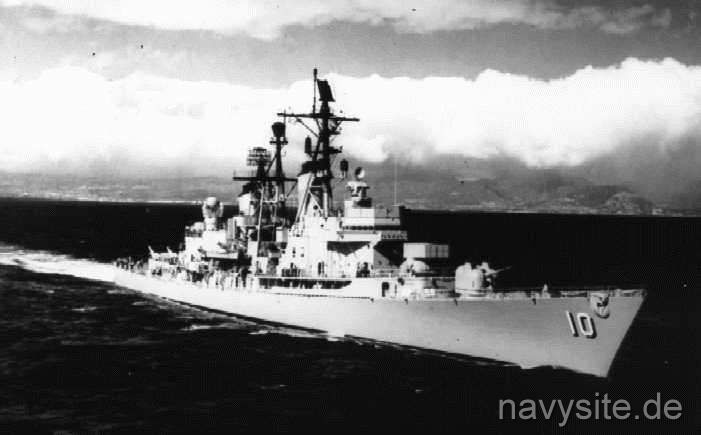 Commissioned as a guided missile frigate (DLG), the USS KING was reclassified as guided missile destroyer (DDG) on June 30, 1975, changing its hullnumber from DLG 10 to DDG 41. 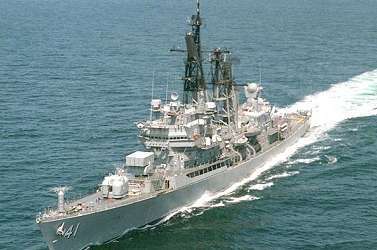 In 1973, the ship served as the test platform for the prototype of the newly developed Phalanx CIWS. 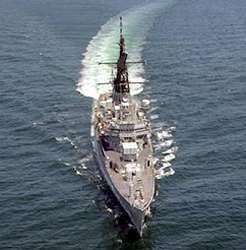 Decommissioned on March 28, 1991, and stricken from the Navy list on November 20, 1992, the USS KING was sold for scrapping on April 15, 1994. The ship was last homeported in Norfolk, Va. Builder: Puget Sound Naval Shipyard, Bremerton, Wash. This section contains the names of sailors who served aboard USS KING. It is no official listing but contains the names of sailors who submitted their information. 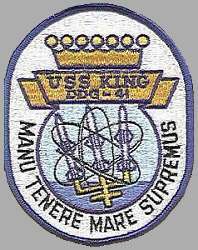 Click here to see which USS KING memorabilia are currently for sale on ebay. 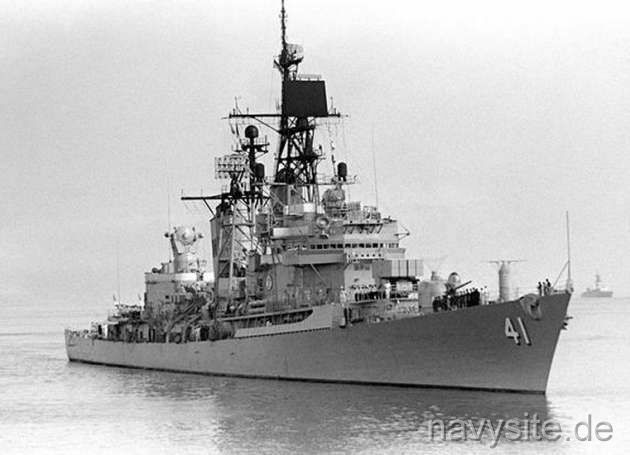 USS KING suffers a fire in the fireroom while operating off North Vietnam, killing four. The ship proceeds to the Philippines for repairs. Ernest Joseph King was born 23 November 1878 in Lorain, Ohio. He was appointed to the Naval Academy in 1897. In July 1898, during the Spanish-American War, he served as Naval Cadet in SAN FRANCISCO, flagship of the Northern Patrol Squadron. Upon graduation from the Academy he was commissioned Ensign 7 June 1903. Prior to World War I King served in the Asiatic Fleet, Atlantic Fleet, and shore duty at Annapolis, Md. During World War I he served as Aide and Squadron Engineer to Admiral Mayo, Commander in Chief, Atlantic Fleet. After the war, with the rank of Captain, he again served at the Naval Academy as head of the Postgraduate Department. King next turned his attention to submarines and the expanded role of naval aviation. After training at Pensacola, he received his wings. He was named Assistant Chief of the Bureau of Aeronautics, Navy Department in August 1928. After promotion to Rear Admiral 26 April 1933 King served as Chief of the Bureau. On 1 February 1941 he was designated Commander in Chief, Atlantic Fleet with the rank of Admiral. Soon after the United States entered World War II, President Roosevelt appointed King Chief of Naval Operations and the Senate confirmed the appointment 18 March 1942. In this office, with wisdom, inflexible integrity, and determination, he mapped out the strategy and vigorously directed the operations of the unprecedented naval campaigns which led to victory over Axis powers in Europe and crushed Japan in the Pacific. By act of Congress 14 December 1944, the grade of Fleet Admiral U.S. Navy was established; his appointment to that rank was confirmed the same day. After he was relieved by Fleet Admiral Nimitz as Chief of Naval Operations, King continued to serve on active duty in an advisory capacity in the Office of the Secretary of the Navy. He died at the Naval Hospital, Portsmouth, N.H., 25 June 1956. During his naval career, Fleet Admiral King received the Navy Cross, and the Distinguished Service Medal with two Gold Stars, in addition to many other awards from the United States and foreign governments. Back to Destroyer list. Back to ships list. Back to selection page. Back to 1st page.